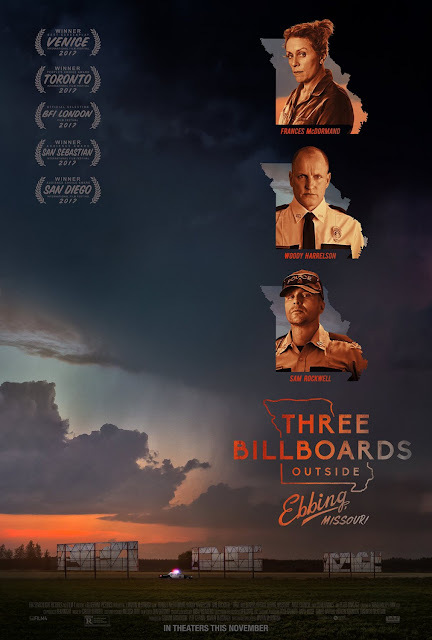 Movie: "Three Billboards Outside Ebbing, Missouri"
The mother of a murdered teenage girl puts up three billboards questioning why the police haven't found her daughter's killer. This puts the police on the defensive, and the ensuing drama throws the small town of Ebbing, Missouri into chaos. When an unthinkable act of violence is committed, it is never isolated to just a perpetrator and a victim. These heinous acts have ripple effects that impact the lives of every person the victim knew as well as those trying to bring the assailant to justice. "Three Billboards Outside Ebbing, Missouri" examines the after-effects of a terrible crime and show how anger and hate cause more anger and hate for one small town. The film stars Frances McDormand as Mildred, the bereaved mother of a young woman who was raped and murdered. Several months have passed since the incident and no suspects have been found. Mildred attempts to put pressure on the local police to try and catch the person/persons responsible. She purchases advertisement space on three billboards on a rural, mostly deserted street outside the main city of Ebbing, right by the scene of her daughter's grizzly murder. These three billboards criticize the police and their efforts (or lack thereof) on the case. Chief Willoughby, played by Woody Harrelson, is specifically targeted, but despite not solving the murder, he is an otherwise respected and loved public official. Mildred's criticism causes a division in the town as they debate what to do about her and her billboards. Also in the movie are Sam Rockwell, Lucas Hedges, Caleb Landry Jones, Kerry Condon, Amanda Warren, Abbie Cornish, and Peter Dinklage. Writer/director Martin McDonagh has created a provocative film with interesting characters that all hover in a moral gray area. None of the characters in this film are perfect, but we can understand where each individual is coming from and see everyone's particular point of view. We understand where Mildred is coming from, though she certainly crosses the line on more than one occasion. She is not only an anti-heroine but is anti-everything a woman is supposed to be: strong with a clenched jaw and tightened fist, unwavering in her disposition and in her right to seek the truth and obtain vengeance at any cost. She infrequently backs down from a fight and only softens when she feels she has to, particularly around her ex-husband, played by John Hawkes, who has very obviously lulled her into submission for a long time with his own fists and rage so she knows no other way to be around him. Chief Willoughby seems like a good man, but has a fair share of skeletons in his closet and makes his own shocking decisions as a result of them. Rockwell's Officer Dixon is a racist good ol' boy who isn't too bright and for some reason still has a job as a cop, but as his character arc progresses, it's clear he has a change of heart, although what it took to get there was enormous. "Three Billboards Outside Ebbing, Missouri" is full of antiheroes and is steeped in irony and dark humor. It packs a strong emotional punch and is extremely relevant to the dark times we face today. Frances McDormand puts on a fantastic award-worthy performance as this extremely layered character who is tough as nails and abrasive as hell but is also tender and loving. Bottom line is, wouldn't you do everything you thought was possible to get justice for your slain child? Mildred embodies and lives this very question to the nth degree. Rockwell is also the standout for us and we fully feel he deserves a nomination for his performance. He is brilliantly ignorant, content in his racist and sexist ways, and is brutal but also kind in his own twisted way. Rockwell is criminally underlooked as a performer and he is absolutely brilliant here. The movie may be offensive to some, but we feel it is sufficiently tragic, enthralling, brutal, and powerful. You should absolutely see "Three Billboards" because it is one of the best of the year.